This is the second post in our Behind the Scenes series. Over the next few weeks, we’ll provide an inside look at the planning and development of the AACR’s Annual Meeting, a must-attend event for cancer researchers. I spoke with Jeff Ruben, senior director of program development at the AACR, for a closer look at this process. Ruben and his staff of 15 people handle programming for the AACR’s more than 25 scientific workshops, meetings, and conferences. With over 18,500 attendees, the Annual Meeting is far and away the AACR’s biggest gathering – so much so that four people in the Program Development Department work on nothing but the Annual Meeting. 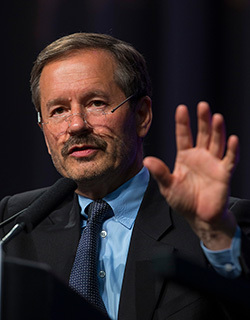 Lewis C. Cantley, PhD, director of the Sandra and Edward Meyer Cancer Center at Weill Cornell Medical College, is the program committee chairperson for this year’s Annual Meeting. Ruben and his staff then get to work on inviting session chairs, who in turn invite the speakers. In addition, Ruben’s team helps to coordinate joint sessions, such as this year’s symposium with the Chinese Society of Clinical Oncology; sessions organized by AACR working groups, including the New Drugs on the Horizon sessions planned by the AACR’s Chemistry in Cancer Research Working Group; regulatory and government sessions, like those sponsored by the NCI; and many more. On top of this, the Program Development Department works closely with the Annual Meeting program committee to organize the approximately 6,000 abstracts the AACR receives into poster sessions and minisymposia. This year, there are 203 poster sessions and 33 minisymposia. The Program Development Department also works with the educational committee, which is separate from the program committee, to plan the educational sessions and methods workshops on the Saturday before the official start of the meeting. 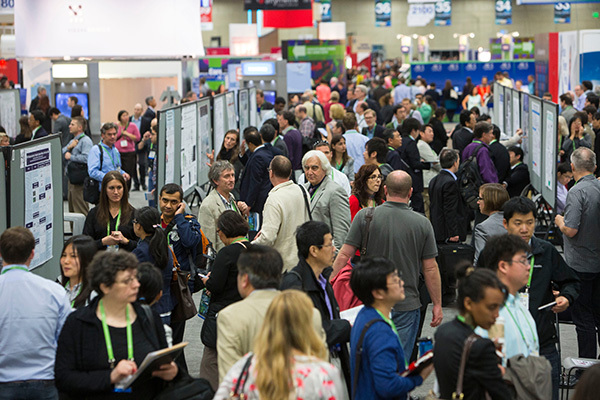 There are 203 poster sessions scheduled for the AACR Annual Meeting 2015 in Philadelphia, April 18-22. Planning an event of this magnitude is an enormous amount of work that touches every corner of the AACR. Like the Meetings and Exhibits Department, the Program Development Department works closely with other departments in the organization – including Marketing, Meetings and Exhibits, Science Policy and Government Affairs, and Scientific Review and Grants Administration – throughout the planning process. By January of the meeting year, it’s all hands on deck. That hard work will pay off when thousands of researchers, physician scientists, and advocates arrive in Philadelphia for this year’s meeting, April 18-22. “People really look forward to this meeting as a way to get the word out about their work and meet other researchers,” says Ruben.